Tuna fishing, beachfront restaurants, fugitives from justice and sea battles. Oh, and naturists too. I spent an hour or so, (it felt a lot longer at the time), last night in the company of a French historian, so please allow me some leeway if this post contains more ‘history’ than would normally be the case. Marigold could have written something far more interesting and engaging, but she didn’t so you’ll have to manage with me. In mitigation, one of our regular followers wrote in praise of the factual content, interspersed with nonsense, and told us he had learned a great deal from following our blog. Barbate is a fairly scruffy town, in fairness – not surprisingly as the local newspaper declares it to be Andalucia’s most deprived town and with unemployment here at record levels - but there’s a good beach and a well cared for promenade and as we arrive on Sunday afternoon the beachfront restaurants are packed, almost entirely with extended Spanish families. 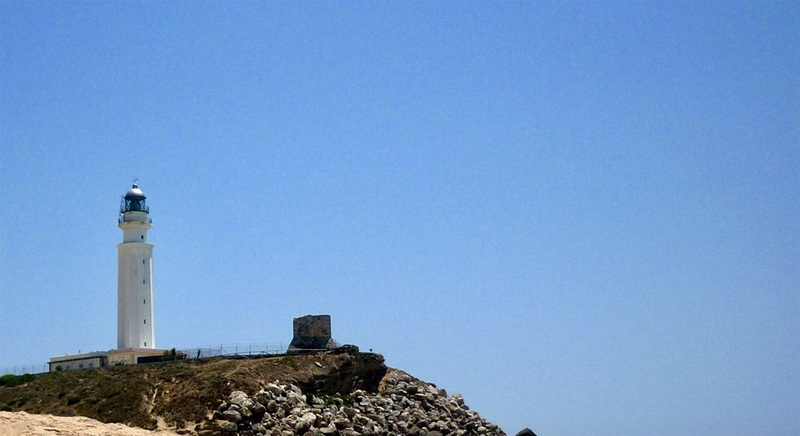 The centre for traditional tuna fishing, a holiday home for a notorious dictator and the setting for the arrest of a notable fugitive; that’s Barbate. It used to be known as Barbate de Franco as Spain’s former ruler liked the place so much he spent much of his free time here. Not something to boast about these days, perhaps, but in harsh economic times it’s surprising how some people yearn for the ‘old days when Franco ensured Spain’s prosperity’ which is the gist of a remark made to us yesterday by a young waiter in Estopona. In any rational context, that’s the opinion of one far too young to remember the Franco years, but since when has actual life experience been any barrier to absolute certainly of conviction? In an era where ‘fake news’ is swiftly acknowledged and regurgitated with seemingly irrefutable assurance, one person’s random opinion can soon reach out to a wider audience. No wonder Donald Trump is showing signs of paranoia. Tuna fishing has been important to Barbate since the Phoenicians arrived here over three thousand years ago and even today the system they pioneered remains in use. Thousands of giant blue-fin tuna pass through the narrow passage between the Atlantic and the Mediterranean on their annual in spring and again in the reverse direction in winter. The ancient method of catching them is known as the almadraba method in which a series of long nets are anchored to the sea bed fairly close to the shore. Tuna, on their spring migration to spawn in the Mediterranean, are trapped in the nets. Once the huge fish are trapped in the final chamber, fishermen in boats pull the net into a tightening circle. The men raise the net, gaffe the tuna and haul them on board. It’s dangerous work as the fishermen wrestle the huge fish, weighing as much as three hundred kilograms, approaching 50 stone, onto their small boats, but the resale value of their catch is enormous. There’s insatiable demand for tuna in the Far East and the vast majority of the catch is shipped, frozen in situ, to upmarket sushi bars and restaurants in Tokyo. Due to indiscriminate overfishing, the Atlantic bluefin tuna, known as in Spanish as atún rojo, (red tuna), is in danger of extinction. The local fishing industry in Barbate and the surrounding region claims, again taken from the local newspaper, that almadraba fishing is sustainable and the decline in numbers is entirely due to offshore fleets of so called ‘factory ships.’ It is estimated that only 0.01 percent of the tuna that migrate through the Straits are captured in the coastal almadraba which would certainly suggest the traditional method is no threat to the continued existence of the blue fin tuna. In contrast to the factory ships, the traditional nets allow smaller fish, and dolphins, to escape and only fish weighing over 70 kilograms are captured. 70 kilograms is over 11 stone in weight. No toddlers involved. These are mature fish who have made the journey to spawn many times and have thereby already added to their numbers. We managed to find a parking space and a free table for lunch, both involving great ingenuity, and sat people watching while we waited to be served. I recently learned a new Spanish word, abuelos, meaning a grandparent, as a couple of our friends have recently gained grandparent status, and there were very many abuelos here today, busily engaged in the vital task of doting on new arrivals. 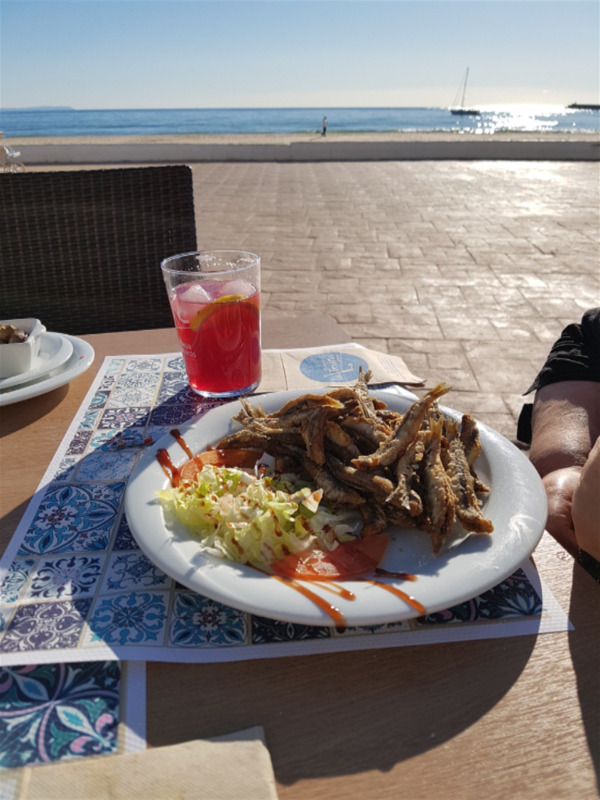 One baby was so tiny it must have only been a few days old, but it’s never too early to enjoy a family meal in the sunshine on the seafront. A little further along the promenade is a famous gourmet restaurant specialising in tuna, naturally, and it was on the terrace of Al Campero one sunny day in August 1998 that Kenneth Noye was finally arrested. Kenneth Noye had been on the run for two years after becoming the prime suspect for the murder of Stephen Cameron in a road rage incident while on licence from prison in 1996. He’d been convicted in 1986 of handling stolen goods from the Brink's-Mat robbery and serving eight years in prison of a 14 year sentence. Noye had been among those involved in laundering a huge quantity of stolen gold bullion taken during the Brink's-Mat robbery by six armed men in 1983. While he was being investigated for his involvement in the crime, Noye stabbed and killed a police detective involved in police surveillance in the grounds of his home and, although cleared of murder on the grounds of self-defence, was found guilty of handling some of the stolen gold and conspiracy to evade VAT. Britain’s most wanted man had been ‘spotted’ in Spain, Tenerife, Lanzarote, Gran Canaria, France, Morocco, Turkey and Russia and police visited 13 countries in the course of their investigation. The police account says they were tipped off about Noye by a holidaymaker who recognised him. Noye was put under surveillance and detectives tracked his wife and son when they visited him. Spanish police officers cooperated with their British counterparts and a glass from which the man had been drinking was taken to obtain the fingerprints that identified him beyond doubt. Stephen Cameron's fiancé, the key witness to the killing, was flown to Spain, discreetly identified the suspect in the restaurant and after her return to the U.K, Kenneth Noye was finally arrested and returned to England for trial. 19 years ago, that was, yet we still can’t see the name ‘Barbate’ without saying, ‘Kenneth Noye.’ Yes, I know, but it will pass, in time. Barbate looked very peaceful today and even the man whom Marigold suspected of being a wanted fugitive as he kept looking around and repeatedly glancing at his watch turned out to be only a long suffering dad waiting for his teenage daughters to arrive. Very disappointing. 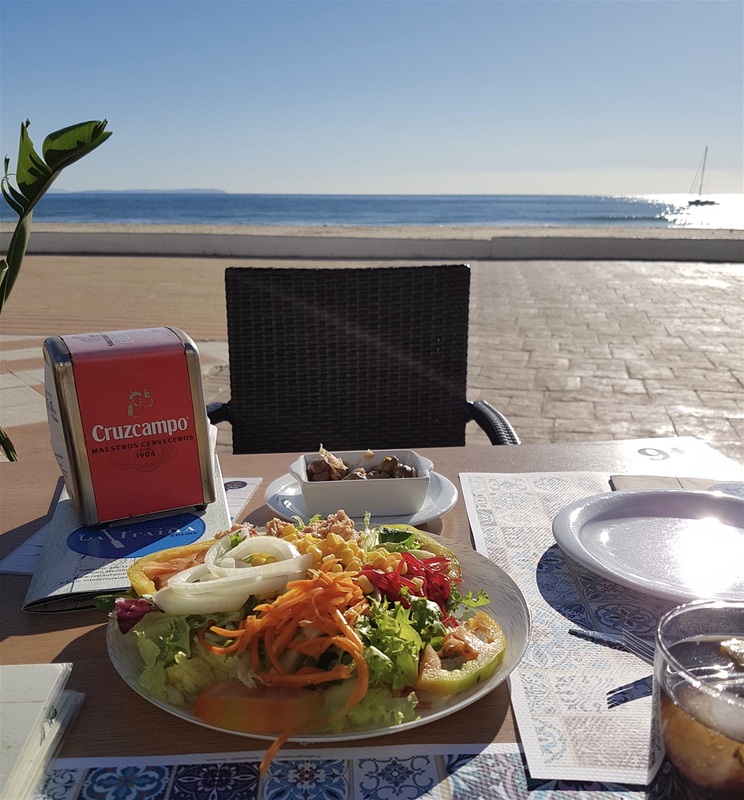 Lunch was great, not as fancy as it may have been at El Campero, but we loved the lively beachfront scene and the unceasing chatter of our fellow diners. 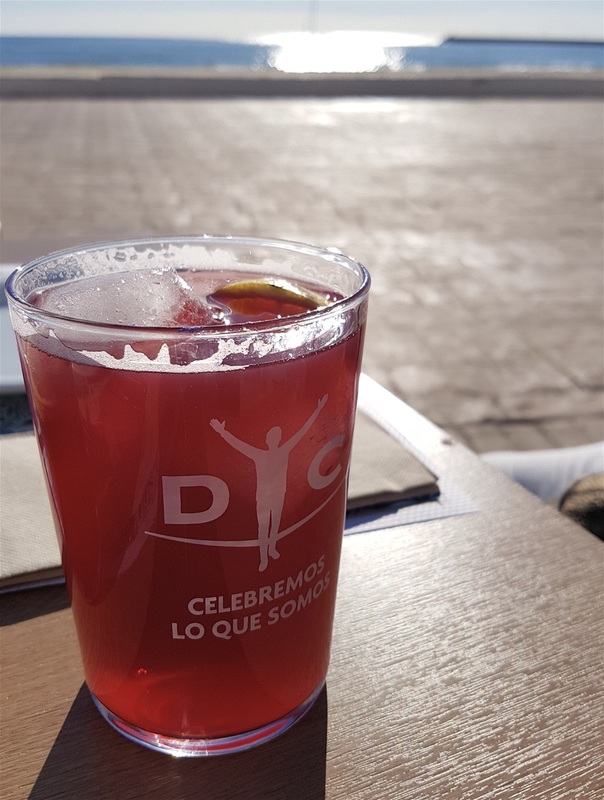 Marigold enjoyed her (very) large glass of tinto de verano - literally ‘red wine of summer’ being a mix of red wine and lemonade - so much, she ordered another one! Our waiter wagged his finger and suggested she would be in need of a siesta very soon. How right he was. One of the waiters dropped a tray of drinks and the whole place erupted in gales of laughter at the poor man’s misfortune with the table of diners who had ordered the drinks leading the way. Odd, isn’t it, how we invariably find such mishaps amusing? I banged my head on the open boot lid of the car on setting out today and thought Marigold would have to go and have a lie down as she was laughing so much. ‘I’ve got jelly legs,’ she gasped, as if that was my fault for deliberately smacking myself on the head with a car door. We were heading for Jerez and had already decided to bypass Cádiz as we’ve been there several times over the last couple of years. This left some time over for another trip to the coast. 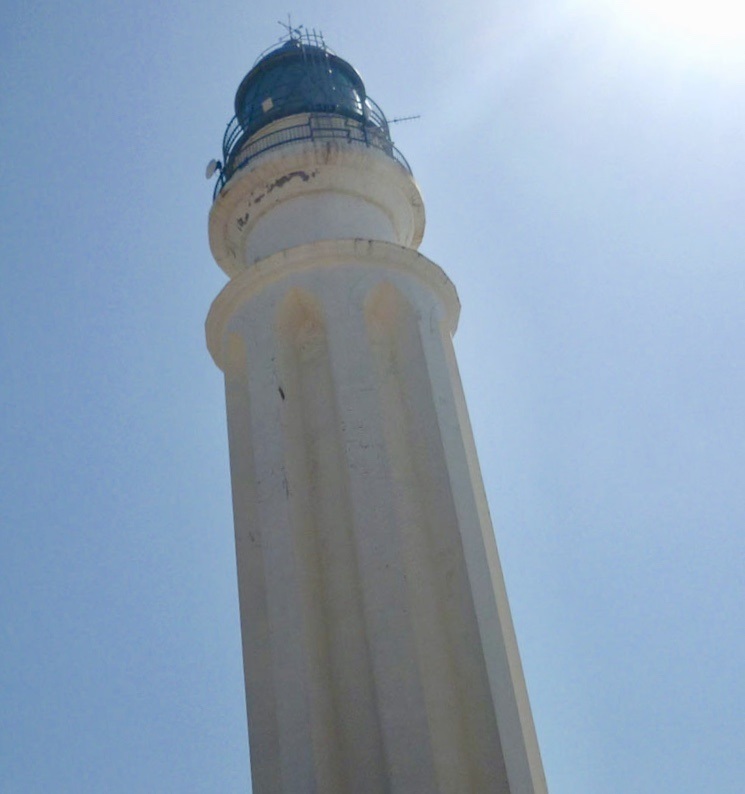 Cape Trafalgar is essentially a beach, naturist in parts, an impressive lighthouse and not much else, but it was off these shores that the definitive sea battle of all British history was fought. We walked the entire length of the beach, up to the lighthouse, no naturists today, and beyond where we found a dozen or so windsurfers and one intrepid kite surfer way out to sea, soaring up high and as we watched, admiring his skill, misjudged a landing and vanished beneath the waves. We were just about getting concerned when his head popped up. No damage, other than loss of dignity. No wetsuit either so the Atlantic water would have been pretty nippy that far from shore. Returning in the direction of the lighthouse, we saw two items of interest we’d missed on the outward journey: a plaque commemorating the sea battle and, rather less impressive, three naked sun worshippers, two males, one very much so, the other not as much, and a woman who we may have mistaken for a large boulder when we walked past previously. They were sprawled, arms akimbo, supine, ie on their backs. If they’d been ‘prone,’ lying face down it may have been less arresting a sight. On second thoughts, maybe not. ‘Is it a rule that only people who look like that can go on a nudist beach?’ Marigold wondered. It’s a fair point as we’ve been on many a naturist beach and invariably come away reflecting on how much better the vast majority of human bodies look when clothed. Today, it wasn’t even a close call as this particular trio just made the place look untidy. We weren’t tempted to join them. Don’t expect naturist photographs; that wouldn’t be seemly. Trust me, it wouldn’t be much appreciated either in this case. Trafalgar holds such significance for the English that I had to check the victory wasn’t merely a jingoistic over-exaggeration. Nelson’s stellar reputation as a certified hero of the nation certainly seems justified. The battle itself took place in 1805, (I knew that, having paid attention in school history lessons. My ability to remember random dates never ceases to bemuse and occasionally even irritate Marigold), and Napoleon was allied with Spain and planning an invasion of England. He needed to assert his supremacy on the seas and the English fleet, commanded by Admiral Horacio Nelson and the combined Franco/Spanish fleet under the command of General Villeneuve had been pursuing each other around the Atlantic, the West Indies and the Mediterranean fir a couple of years, before finally coming together for what became known as the Battle of Trafalgar. Villeneuve formed a battle line three miles long with his forty ships. The rival fleets sailed onward and Nelson hoisted a flag signal "England expects every man to do his duty” as he gave the orders that unleashed a series of unexpected and quite revolutionary manoeuvres, throughly confounding the opposing fleet. During the battle, a French sniper fatally wounded Nelson and the great man uttered his famous dying words, ‘Thank God I have done my duty.’ Yes, he also is rumoured to have said, ‘kiss me, Hardy,’ to the captain of the Victory as he lay dying, but the ‘done my duty’ words were destined to be his last. Of the forty French and Spanish ships, only ten survived and over 4,500 men died in the battle. The English had far fewer casualties, but lost their best and much beloved admiral, Admiral Nelson. Napoleon was to remain a threat to England for a further ten years, but if Waterloo marked an end to hostilities, Trafalgar had been the point of no return as far as an invasion of England was concerned. Nelson's body was brought ashore and placed in a brandy vat to preserve it during the long journey back to England. The English sailors who were not buried at sea, but who later died of their wounds, were buried in the Trafalgar Cemetery in Gibraltar. We’ve been to Gibraltar several times – not one of our ‘favourites’ in fairness, (is it possible to be too British? ), but never been to the Trafalgar Cemetery. Better put it on our ‘to do’ list, if only we had one! Salad to start, with tuna served separately. Not bad for three euros. Anchovies? Not for me, thank you! 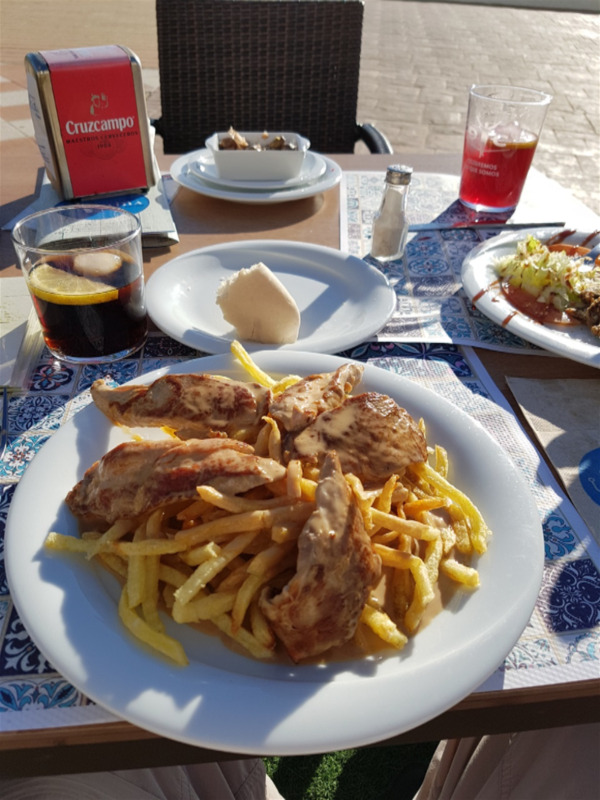 We could have lunched at the sister restaurant of El Campero in Zabara, but went to Barbate instead. 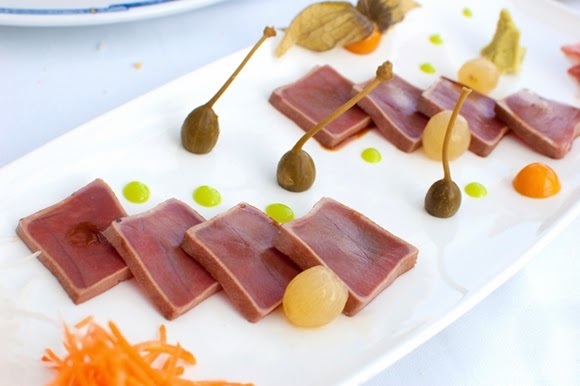 Lunch of raw tuna at El Campero. Oh, okay, maybe another time. Looks nice on the plate though.